Some actors just have a gift for camp. 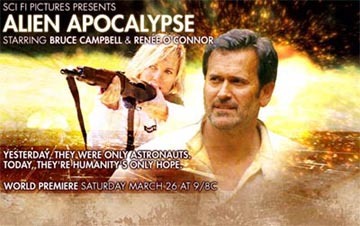 And Bruce Campbell is one of them. Over the years, camp has gotten a bit of a bad name. Once upon a time, back before the Earth cooled, camp was a semi-respected comedic form; it was the American equivalent of an English farce, and is a genre that includes such notable films as Kentucky Fried Movie and The Rocky Horror Picture Show. But camp is rarely done any more, or at least not intentionally, and it has come to be viewed as a sort of red-headed stepchild of the more mainstream subdivisions of the broad genre that is comedy. One of the reasons for this is the fact that good camp isn't easy to pull off; it requires the script and the actors to walk a fine line between inspired silliness and sophomoric jokes. The humor has to be broad, but not too broad; it's not slapstick, but neither is it subtle. If the mix isn't just so, you're not laughing but instead glancing at your watch, wondering how much longer the picture has to run. It's a tightrope, and some of the best purveyors of humor have fallen off it and into the precipice of the dreaded Unfunny Comedy.